Hydroxy-vitamin D3 derivatives and the vitamin D3 receptor complex. The cover illustrates the structures of typical oxygenated and fluorinated vitamin D3 derivatives, together with the crystal structure of 1,25-dihydroxyvitamin D3 and the receptor complex (pdb code: 1db1). The side chain of vitamin D3 is metabolized to various hydroxylated derivatives, such as 24,25-dihydroxy vitamin D3, 25,26-dihydroxy vitamin D3 and calcidiol lactone, as shown. These vitamin D3 metabolites were microanalyzed by GC-MS/LC-MS and the importance of the stereochemistry of the side chains of the oxygenated vitamin D3 derivatives made clear. Furthermore, synthesis of the vitamin D3 derivatives having fluorinated side chains demonstrated the importance of hydroxylation and led to the further design of polyfluorinated vitamin D3 derivatives. 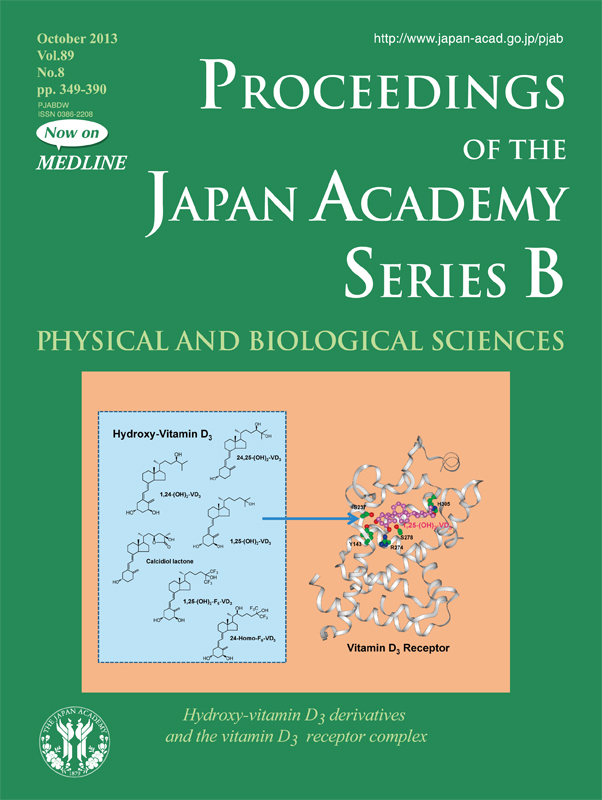 Dr. Ikekawa and his colleagues have long been concerned about the identification and the synthesis of the vitamin D3-related compounds which contributed significantly to studies of the bioactive properties of vitamin D3. Crystallographic analysis of the vitamin D3 receptor structure (shown on the right hand side) revealed details of the ligand binding site, which accounts for the interaction between vitamin D3 ligands and receptors at the atomic level. The figure illustrates the binding mode of 1,25-dihydroxy vitamin D3 in the receptor-ligand complex. In this figure, the 1,3-dihydroxyl group of the ligand shows hydrogen bonds with amino acid residues, such as arginine, serin, and tyrosin, and the 25-hydroxyl group in the side chain interacts with a histidine residue, which is important for receptor activation. This complex structure enables us to understand the relationships between bioactivity and the stereochemistry of the side chain, as well as the length of the side chain. The chemical and biological work on the structure-activity relationships of the vitamin D3 derivatives shown in this figure will lead to design of new vitamin D3-related compounds. The work also correlates with the structures of the insect hormones (ecdysteroids) and plant hormones (brassinosteroids), the bioactive potency of both being determined by the stereochemistry of the hydroxyl groups and the carbon number of their side chains. 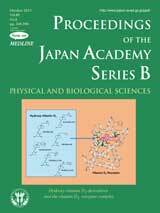 Thus, Dr. Ikekawa and his colleagues have contributed to the understanding of the roles of steroidal side chains of biologically active steroids not only in humans but also insects and plants.